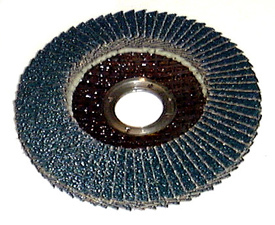 Flap discs can do the job of both a depressed center grinding wheel and resin fiber disc. They typically last about 10 times longer than resin fiber discs. Always wear safety glasses and other protective equipment when using flap discs. Flap discs with 7/8" arbors mount on 4-1/2" or larger grinders that have the proper support flanges and retaining nut. The 4" flap discs with 5/8" arbor generally mount on the smaller 4" grinders. Flap discs with 5/8-11 threaded arbors mount directly on the tool shaft without any other flanges. Fiberglass back flap discs have a molded back plate that will dissipate with the disc. They are best for finishing operations were you want to prevent the possibility of the back plate scratching the work piece.